You don’t need to live in Oregon to enjoy the best of what our land has to offer. Our spreads, jams and chutneys bring the sweet, tart flavor of Oregon cherries to you throughout the year. We’ve found that cherries go well with just about everything -- as a condiment for pork, a spread for cheese and, of course, on a thick slice of toast. Here’s one of our favorites ideas below. What do you do with our jams, spreads and chutneys? We’d love to hear from you! Put one of the chicken breasts skin side down in a zip lock bag. Pound with meat clever until chicken is flat and about 1cm thick. Repeat with other chicken breast. 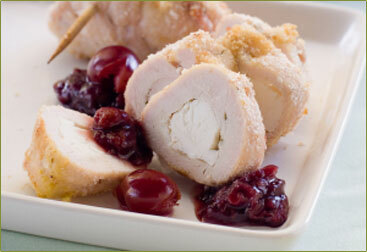 Bring sides of the chicken up to cover cheese filling and secure by sticking wooden kabobs or toothpicks. Smear the skin with butter and season with salt and pepper. Roast for 30 minutes, then cover with foil and let rest for 10 minutes. Serve the cherry chutney on top or the side, also with fresh halved cherries. Bake in preheated oven until phyllo is golden, about 20-30 minutes. Place onto serving platter, and spoon the Cherry Chutney over top.